Love your new shelf with that yummy thick wood! It looks awesome!! Very cool sign above your French door too! Simply devine! I love every single thing about your kitchen...and that green door, wow! We had a double oven that came with this house and when I did a mini-remodel a few years ago we replaced it with a stovetop and built a display area where the microwave sat...so I know exactly what you mean by feeling cramped when cooking. I'd love to have a seat on that stool, I know we'd have a great time visiting! I love the green door! Green is my favorite color and this is a great choice! I love your bread boards and look at them often . I would love to have one but would find it hard to use and make cut marks on it. I love beautiful wood. The green door looks great and what a lovely colour! Wow, I love your new rustic shelf! It is so much better than the microwave. I think you have outdone yourself this time! The green door is killer too. LOVE IT!!!! Dying to know the paint color of your kitchen! I love your entire house! I for some reason cannot click on your link to the spice jars. I was just wondering if it is just me. Thank you! These changes are so lovely, especially the shelf and the green French door. Well done!! Your kitchen is so pretty! Love the new walnut open shelves and the green door looks fabulous! Your kitchen looks amazing and I'm so glad you shared the paint colour for your door because I would have asked for the colour name - it's the perfect complement to your rustic shelf and other vintage pieces. I'm slowly transforming our kitchen and have pinned this for some future inspiration! It all looks so lovely, I love your little spice jars and that stool is to die for! I love your kitchen redo. I can't wait to redo our kitchen and hope it looks half as pretty as yours. I think your open shelving makes a huge impact and is so lovely. On a side note, my family is in the food business and my Mom is a certified olive oil taster. As pretty as oil looks out on a shelf it is really the worst place to keep it as the heat destroys it. It should be kept in a cool, dark place away from heat to keep the flavors the best, preferably in dark glass or ceramic. Just a little tip. So incredibly gorgeous. I love your kitchen. I want to live there. :) It's such a happy place. When we moved to Uganda we didn't bother to purchase a microwave for a couple reasons: 1. Power was unpredictable and off and on quite frequently. 2. We're cheap. and only here for 2 years. I LOVE not having a microwave. I've mastered the art of reheating leftovers either on the stove or in the oven depending on what it is. Also? Popcorn ON the stove is a million times better than microwave popcorn. The only thing I could see myself using a microwave for now is reheating cold cups of tea or coffee (which are frequent with me being a Mom to two young boys, soon to be three). When we move back to Canada, I think we'll make do without one and use the space for other things if possible - depending on the house we end up living in. We have a microwave, but we only use it to store bread (it came with the house). To be honest, microwaves kind of gross me out, with how they make food rubbery and heated unevenly- so we use a toaster oven to reheat leftovers. I've known people to keep their microwave in an outleted cabinet, though, so it's tucked away. I only eat air-popped popcorn so we really don't have a need for a microwave. After we move we won't have one at all (unless our new house comes with one, in which case- bread box). Oh, and getting a toaster oven to reheat leftovers keeps your electric bill down a little, and doesn't heat the house as much as turning on the whole oven. Unless you're reheating a large amount, of course! I love it all. Your kitchen is amazing. Awesome shelf!!! I can't live without my microwave... tried for a couple of weeks but I always go back, it's just too handy and I'm too busy to give it up. The green door makes me smile, it's that perfect extra little touch. LOVE, love, love your kitchen and your new changes! The wood brings a warmth into the space and the green door is the perfect pop of color! The bar stool was a wonderful find1 Your whole kitchen inspires me! every detail is perfect! beautiful. i don't live w/o a micro, but have been given tips by my sis...you can reheat many things by steaming them in a steamer basket and of course, the oven depending on the food. what surprised me was reheating chicken and meat in the steamer. Wow, everything looks beautiful! I love, love the shelf. It really opens up that area doesn't it? The spice jars are adorable and I agree...I like the "pretty" look vs the original containers any day. Thanks for sharing the website to purchase them. The floor mat is calling my name! :) Love, love black & white/ivory in anything. Great job on this and creatively adding the backing. I would never have thought of that! The green door is a really nice pop of color. I think I could become accustomed to not using a microwave although I live in an apt and really don't have a choice. There are so many things published now about them being detrimental to one's health...who knows? Thanks for sharing all the good stuff! I LOVE everything about this! The shelves you hung above the counter inspired me to make some for my new office space. I followed the directions for aging the wood on your dining room table post and they turned out lovely! (yes, I survived the "man lumber" section at Lowes!!) I couldnt be happier. I was hoping to use the same type of track system that you used, but couldnt find any black ones at Lowes. (only white which I suppose I could paint if I had to) Where did you get the brackets? Your blog has given me so many great ideas for my home. Thank you!!! Great job!!! Everything looks so beautiful! I am so enjoying your blog. I love your home. I am in love with old houses and yours is beautiful love,love,love!! Thanks so much for telling us what colors you use and where to buy things. I hate I was to late on the bread boards. But I like the mini set too. Oh my, my, my!!! I love every detail! I have wanted a checkerboard floor my entire life....even as a young girl. We have red fir in our kitchen and I want to paint it black & white.....am I CRAZY??? Maybe I should start with your rug---thank you sooo much for adding the tutorial. We have a small microwave and I had a shelf built for it. The unit fits perfectly on it, plus my toaster and small coffee pot sit underneath it. If this little shelf was "out" where it's the first thing you'd see in our townhouse galley kitchen, I'd make cute doors to hide under the shelf, a sliding track (garage) door or fit it with a cute curtain. We use the coffee pot every morning, then it's parked out of sight. We use the toaster less often and the microwave for leftovers. This house is a rental, so I've made this arrangement work. The microwave shelf is great and I love the green door! Would you mind sharing what brand paint and color you used on the door? I love the thick walnut shelf! And your green door (green is after all, my favorite color!). The stool is so cool! Ok, I just love the whole thing - you did great with it all! :) Right now, I have a small microwave on the counter at the farm and I'm not particularly liking it there. Thinking of moving it into the pantry/laundry room but it is convenient where it is. 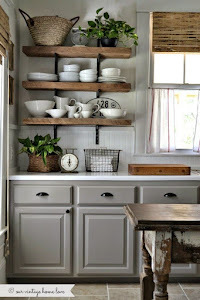 The distressed wood shelves and table look great together. The shelf was definitely an improvement over the microwave. We tried to hide our microwave by tucking it into the base cabinets, but it is still a microwave....which is a modern appliance. If we didn't use it so much, I would have liked to remove it entirely, like you guys did. When my husband and I bought our house (circa 1956) there was a laundry/pantry room off of the kitchen on the way to the garage. That room held a washer, dryer and the hot water heater. We moved the washer dryer to the garage, and the hot water heater to the attic above the garage. Tore out the huge, dysfunctional pantry and made a butlers pantry. We opened up the door casing, installed all new cabinets and drawers and added a single oven. I use the single oven during holidays when I need more oven space than my primary oven offers, or when it's hot and I don't want my kitchen heated up. I say all this to tell you that my microwave sits on one of the counters in the butlers pantry. We only reheat or make rice in it, so it's not used often and I'd rather it not be in my kitchen. LOVE the wood! It looks amazing. I also love all of wooden rolling pins and cutting boards you have out in your kitchen! They make your kitchen looked loved...a place where you and your family love to spend time together. I have some of my great-grandmothers wooden rolling pins and cutting board. I'm going to have to pull them out for display. Your ideas never cease to amaze me!! Love it all! Really enjoyed reading your bread board testimonial...I too love to give old things a NEW look...would love for you to drop by Blessings Beyond the Barnyard. I'm a fairly new blogger. Sharing real stories about real life with the hope of encouraging, exhorting and exciting others. Your kitchen is lovely! I think I could stare at it for a better part of the day! Thanks for sharing! Hi! I love your home:) Where did you get the letters above the window? The "FAMILY" letters? Thanks! Hi! I love your home:) Can you tell me where I can get the letters you have above your window? The "FAMILY" letters. Thanks!! I adore everything about your kitchen especially the careful placement of your olive oils and spices! I have a spice rack that was given to me by my cabinet builder to match my island and I've been looking for fun jars to transfer my spices to. I love yours, but they may be too fat! You'll have to head over to my blog, old blue silo. I just revealed my kitchen yesterday, including my little spice rack! I love this! Such a beautiful kitchen. What paint color did you use for the kitchen walls? yes what color did you use for the walls?